i did not compare him to Melo because ,i repeat, do not know Williams! What i said is that claiming someone as a possible legend because he jumps high and has big hands is not very smart as recent picks like Fab Melo have shown. Maybe just reading the measurements and make assumptions about a player is saver than watching him play. I love the fact that since he came to Boston, he is in the gym at 630 am. what I really like about Williams is how fast he is to get off the floor to dunk and contest shots. He reminds me a lot of Brandon bass in that regard, just so fast to get the ball to the rim that he rarely ever gets his shots blocked. Now if he ever developers Bass's midrange game he's going to be a problem. I seen him mocked as high as 7 if came out last year. He is an athlete of the highest level. 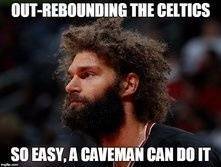 I see him playing some and more if we don't keep Baynes. There is no way we should have passed on him at 27. He has a skill set we don't have and need. He can jump and he is long. I also think our special team can motivate him to be a starter in year 3. I found 2 sources claiming RW has a 9'4'' standing reach but does anyone have anything concrete or other sources. Standing reach is not mentioned enough, if ever, when people are discussing players and it should be brought up.... especially with big men. In this video, P3 Sports Science shows a spider chart which includes standing reach. It didn't show the height, but it stated he was in the 80% when compared to other NBA centers. That means he has a higher standing reach higher than 80% of other NBA centers. His max vertical was about 100%. In this video, P3 Sports Science shows a spider chart which includes standing reach. It didn't show the height, but it stated he was in the 80% when compared to other NBA centers. That means he has a higher standing reach higher than 80% of other NBA centers. His max vertical was about the 100%. But this data is 4 years old and more teams have embraced small ball lineups since then. If P3 has Williams 7'6'' wingspan at 90th percentile then an 80th percentile for standing reach could easily be 9'4''....depending on what data and averages they are going on for the "average nba center"
It shows in the game clips, he reaches some impossibly high lobs. Considering how relatively weak we are at passing oops, save for Smart, it's good to have somebody with reach like that to pull in slightly errant oops. Just for reference here is Dwight touching 12'6" on a B-ball hoop. He should just retire now, so that he can get a head start on the Hall Of Fame.